This type of element, for the horizontal fitting position, was created because of the market requirement and the close collaboration with our customers. A lot of market requirements could be integrated in one construction which can summarize both a technical interesting alternative and cost-efficient solution for our customers. There were used only traditional materials and well known element-forms, which are known to have a long lifetime. In some cases, you will not get the benefit of all the advantages at once. This depents upon the requirement of the technical installation. Depending on the requirement of the construction, heating-candles can also be performed with a steel-tube, which is also permitted for using with surface-temperatur up to 1350°C. The blue power-line in the following chart shows you the common parameters as they are used in the plant- and furnace-construction. 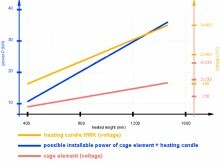 Comparison between cage-element and heating-candle at temperatur of about 1000°C with about 4 W/cm2 surface-loading and a element-diameter of 158 mm. As you can properly see, the heating-candel HWK uses power supply already at small construction-dimension. 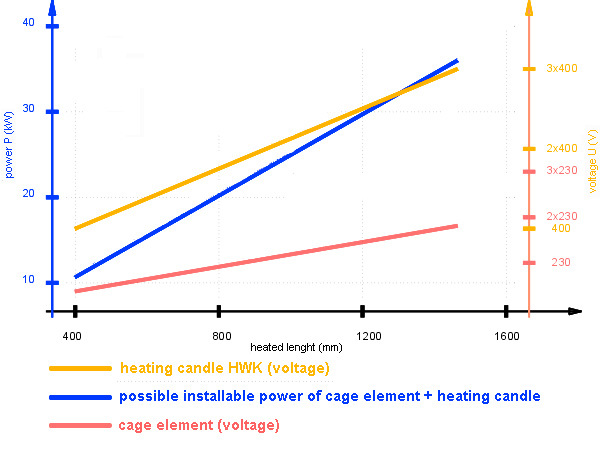 The yellow voltage-line of heating-candle HWK, expresses the big difference of voltage in comparison to the red voltage-line of a cage-element. If we have inspired your interest, please leave your heating-problem – to become ours.